An epic musical some forty-years in the making, the world premiere of Jim Steinman's Wagnerian, post-apocalyptic masterpiece, Bat Out of Hell, now bursts onto the Manchester stage in mind-blowing fashion, following almost a month of previews. An extraordinary, high-octane, multimedia masterpiece, incredibly staged on a colossal scale, Bat Out of Hell is surely the must-see theatrical event of the year. In a dark, angst-fuelled plot that will feel strangely familiar to all the We Will Rock You fans out there, Bat Out of Hell unfolds in the futuristic land of Obsidian in the year 2100, a post-apocalyptic, war-torn world where un-aging teen rebels known as The Lost are forced into a brutal fight for freedom against the oppressive powers of a totalitarian state. At its centre are Obsidian's very own Romeo and Juliet, Strat and Raven, the former, a fearless bad-boy biker and member of the insurgent band, the latter, the oppressed daughter of the villainous head of police, Falco, love-struck and desperate to escape her domineering, over-protective father’s suffocating clutches. Andrew Polec and Christina Bennington are exceptional in the star-making central roles, demonstrating great chemistry and enviable vocal gymnastics throughout. Though there are clear echoes of Meat Loaf's original vocals in his performance, Polec perhaps wisely refrains form a direct impersonation, instead putting his own unique spin on things. Vocally Bennington doesn’t get much of a chance to shine in the first act but really comes into her own after the interval with a hair-raising performance of Heaven Can Wait and stirling duets (with Polec) of For Crying Out Loud and I'd Do Anything For Love (But I Won't Do That). Rob Fowler as principle antagonist Falco and Sharon Sexton as his wife Sloane are again outstanding, and their rendition of Paradise by the Dashboard Light is a real standout. Unsurprisingly, the supporting ensemble is of an equally high standard, and the collective sound produced is truly haunting, however there are particularly strong performances from Danielle Steers as Zahara, Dom Hartley-Harris as Jagwire, Giovanni Spano as Ledoux and Andrew Patrick-Walker, who joins Harris and Spano in a beautiful rendition of Objects In The Rearview Mirror. Multi-layered, multi-textured and multi-dimensional, designer Jon Bausor's towering set is without doubt one of the most advanced and ambitious the theatre has seen, further elevated by the superb work of lighting designer Patrick Woodroffe and video designer Finn Ross. It is rare that a full-scale West End production ever reaches the regions; this is a glorious exception. The multiple video screens dotted around the various levels of the theatre are a very effective tool to further enhance the show's autocratic theme of surveillance by relaying a live feed of many of the scenes staged out of central view, as well as ensuring that the action reaches everyone so no seat ever suffers from a restricted view. Featuring seventeen of Steinman and Meat Loaf's greatest hits, alongside six new Steinman compositions written exclusively for the show, Bat Out of Hell's hugely demanding rock score is given a blistering rendering courtesy of a sublime ensemble and magnificent twelve-strong band, led by musical director, Robert Emery, and tucked away deep beneath the stage. It would have been nice to have the band on-stage and on-display throughout, as with the likes of We Will Rock You, but given the vast size of the set, perhaps space just did not allow for it. Constantly challenging audience expectations and the possibilities of the theatre space, director Jay Scheib and choreographer Emma Portner's flawless production is a sure-fire masterpiece, and one that has raised the musical theatre bar quite significantly. 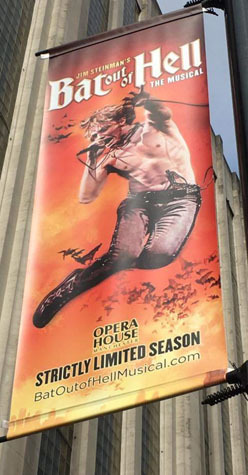 Following its run at the Manchester Opera House, Bat Out of Hell will transfer to the London Coliseum for a limited 56-performance season from 5 June to 22 July, 2017, though it is to be hoped another West End theatre will quickly be made available once the Coliseum run has commenced.